The Last Prophet book series follows the journey of Dr. Sophia Randall, as she grows in her faith and mission as the chosen Last Prophet of our time. This book series will take you through Sophia's spiritual transformation as she walks with humanity, Angels, and God. This page is dedicated to fans of spiritual fiction reading, and the writings of Author Claire Gager within the genre of spiritual fiction. The Last Prophet book series is a mix of spirituality, faith, fiction, history, and current events that will leave readers with a desire to take a deeper look at their lives and its direction. Visit the News! News! News! 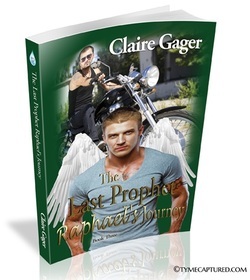 section of this site to sign up on Claire Gager's Author social media sites. The Last Prophet: Guarding Sophia (Book 1). The Angel of Death has a mission to kill Sophia. Her Guardian Angel is her body guard. Who will win the battle? Who has more strength? Will Sophia survive to become The Last Prophet? The Last Prophet: Michael's Mission (Book 2). Allana was trying to earn her graduate degree from USC in Television, Film, and Media Arts. With the climbing responsibilities, Allana found less and less time for her personal life. The mounting stress was causing her grief in ways she never imagined, but she tried to fool herself in believing it was normal. Finding herself in the hospital after collapsing on a city sidewalk, she was forced to face her reality. In order to continue her studies, she agreed to seek the help of a therapist, Dr Sophia Randall. For Michael, as the General of the Celestial Army of God and Prince of the Heavenly Host, he had never been assigned the special task of watching over only one special soul as a guardian angel. When Michael was assigned Allana, “All glory and praise to you, Almighty and Ever Living One,” the angels’ songs of praise rang out across the heavens.” Would Michael be able to guide and protect his special soul? Or would the fall of humanity come on Judgment Day? The Last Prophet, Raphael's Journey (Book 3). When Joseph “Joe” Copper’s grandparents die and his relationship with his sister and parents become strained, he turns to drugs, alcohol, self-mutilation, and thrill seeking as a means to numb his pain. Joseph proudly carries his pride of personal survival as a badge of honor during and after his service in the US Army until the night he sees his sister on TV and Joe hits rock bottom. It would be up to Raphael, Joe's guardian protector, to show him that his weaknesses could serve him as a shield if he allowed the Most High God to be the force behind the shield. Joe would need to learn how to pick his battles and that every fight was not always best won with brute force. Raphael would not only heal Joe's damaged body, but his broken spirit and heart as well.